American made communion supplies by Christians, for Christians. Leadership badges are manufactured from a zinc alloy, which allows for a strong yet very light-weight badge, and have a magnetic attachment for easier placement on a variety of clothing. 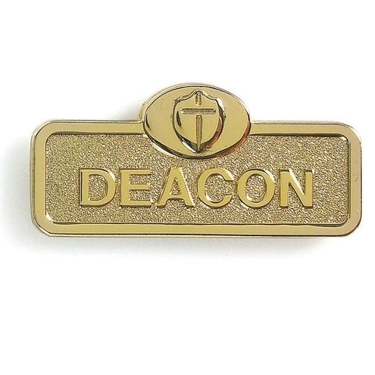 This Brass Deacon Badge measures 2 1/16″ x 2/3″. The header card includes a warning for wearers of small electronic devices, such as pacemakers, as the magnets may negatively impact those devices. © 2019 The Storehouse of Religious Goods. All rights reserved..
© 2019 The Storehouse of Religious Goods. All rights reserved.